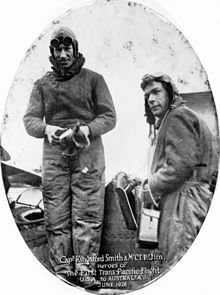 Sir Charles Edward Kingsford Smith MC, AFC (9 February 1897 - 8 November 1935), often called by his nickname Smithy, was a well-known early Australian aviator. In 1928, he made the first trans-Pacific flight from the United States to Australia. He also made the first non-stop crossing of the Australian mainland, the first flights between Australia and New Zealand, and the first eastward Pacific crossing from Australia to the United States. He also made a flight from Australia to London, and set a new record of 10.5 days. 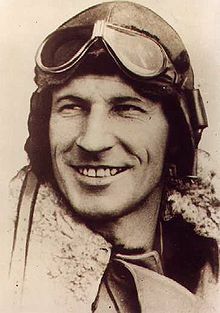 Charles Edward Kingsford Smith was born on 9 February 1897 in Hamilton (a suburb of Brisbane), Queensland, Australia, and was the youngest of seven children of William Charles Smith, a bank manager, and Catherine Mary Kingsford, daughter of Richard Ash Kingsford, a Member of the Legislative Assembly of Queensland. Like his siblings, Charles's birth was registered with the surname Smith. However, his parents found having such a common name as Smith too confusing and so adopted the use of "Kingsford Smith" as the family surname. From 1903 to 1907, he and his family lived in Vancouver, Canada. On 2 January 1907 young Charlie Smith was rescued from certain drowning at Sydney's famous Bondi Beach by bathers who, just seven weeks later, were responsible for founding the world's first official surf life saving group at Bondi Beach on 21 February 1907, at a meeting held at the Royal Hotel Bondi Beach. Upon returning to Australia, he attended St Andrew's Cathedral School in Sydney where he was a treble chorister in the cathedral choir. He then studied electrical engineering at Sydney Technical College (now known as Sydney Technical High School). At 16 Kingsford Smith became an engineering apprentice with the Colonial Sugar Refining Company. After that, he enlisted for duty in the armed services in 1915 and served at Gallipoli. Initially, he performed duty as a motorcycle despatch rider, before transferring to the Royal Flying Corps, earning his wings in 1917. In August 1917, while serving with No. 23 Squadron, Kingsford Smith was shot down and received injuries which required amputation of a large part of his left foot. He was awarded the Military Cross for his gallantry in battle. As his recovery was predicted to be lengthy, Kingsford Smith was permitted to take leave in Australia where he visited his parents. Returning to England, Kingsford Smith was assigned to instructor duties and promoted to Captain. On 1 April 1918, along with other members of the Royal Flying Corps, Kingsford Smith was transferred to the newly established Royal Air Force. On being demobilised in England, in early 1919, he joined Tasmanian Cyril Maddocks, to form Kingsford Smith, Maddocks Aeros Ltd., flying a joy-riding service mainly in the North of England, during the summer of 1919, initially using surplus DH.6 trainers, then surplus B.E.2s. Later Kingsford Smith worked as a barnstormer in the United States before returning to Australia in 1921. He did the same in Australia and also flew airmail services, and began to plan his record-breaking flight across the Pacific. Applying for a commercial pilot's licence on 2 June 1921 (in which he gave his name as 'Charles Edward Kingsford-Smith'), he became one of Australia's first airline pilots when he was chosen by Norman Brearley to fly for the newly formed West Australian Airways. During the first World War, a man named Ken Richards was the observer in Kingsford Smith's plane in France. After the war, Richards moved to Cowra, New South Wales. Kingsford Smith owned an old Avro plane and in 1922 he flew up to Cowra to see Richards. While in Cowra Kingsford Smith and Richards flew under the Cowra traffic bridge. The pair also attempted to fly under the nearby railway bridge but Richards noticed telephone lines seconds before the attempt and they were able to pull the aircraft up and away from certain death. Picture - The Southern Cross at an RAAF base near Canberra in 1943. Kingsford Smith and Charles Ulm arrived in the United States and began to search for an aircraft. From the famed Australian polar explorer, Sir Hubert Wilkins, they purchased and equipped a Fokker F.VII/3m monoplane, which they named the Southern Cross. At 8:54 am on 31 May 1928, Kingsford Smith and his crew left Oakland, California to make the first trans-Pacific flight to Australia. The flight was in three stages. The first (from Oakland to Hawaii) was 2,400 miles, took 27 hours 25 minutes and was uneventful. They then flew to Suva, Fiji 3,100 miles away, taking 34 hours 30 minutes. This was the toughest part of the journey as they flew through a massive lightning storm near the equator. They then flew on to Brisbane in 20 hours, where they landed on 9 June after approximately 7,400 miles total flight. On arrival, Kingsford Smith was met by a huge crowd of 25,000 at Eagle Farm Airport, and was feted as a hero. Australian aviator Charles Ulm was the relief pilot, and the other two crew members were Americans James Warner and Captain Harry Lyon (who were the radio operator, navigator and engineer). Picture - A photograph commemorating the first trans-Pacific flight. A Screen Australia movie of the event is available. A young aspiring New Zealander named Jean Batten attended a dinner in Australia featuring Kingsford Smith after the trans-Pacific flight and told him "I'm going to learn to fly." She later convinced him to take her for a ride in the Southern Cross and went on to become a record-setting aviatrix, following his example instead of his advice ("Don't attempt to break men's records - and don't fly at night", he told her in 1928 and remembered wryly later). After making the first non-stop flight across Australia from Point Cook near Melbourne to Perth, in Western Australia in August 1928, Kingsford Smith and Charles Ulm registered themselves as Australian National Airways (see below). They then decided to attempt the Tasman crossing to New Zealand not only because it had never yet been done, but also in the hope the Australian Government would grant Australian National Airways a subsidised contract to carry scheduled mail on a regular basis. The Tasman remained unflown after the failure of the first attempt in January 1928, when New Zealanders John Moncrieff and George Hood vanished without trace. Kingsford Smith's flight was planned for takeoff from Richmond, near Sydney, on 2 September, with a landing around 0900 on Sunday 3 September at Wigram Aerodrome, near Christchurch, the principal city in the South Island of New Zealand. This plan drew a storm of protest from New Zealand churchmen about ‘setting the sanctity of the Sabbath at nought’. The mayor of Christchurch supported the churchmen and cabled a protest to Kingsford Smith. As it happened, unfavourable weather developed over the Tasman and the flight was deferred, so it is not known if or how Kingsford Smith would have heeded the cable. Accompanied by Charles Ulm, navigator H.A. Litchfield, and radio operator T.H Williams, a New Zealander made available by the New Zealand Government, Kingsford Smith left Richmond in the evening of 10 September, planning to fly overnight to a daylight landing after a flight of about 14 hours. The 1,600 mile / 2,600 km planned route was only just over half the distance between Hawaii and Fiji. After a stormy flight, at times through icing conditions, the Southern Cross made landfall in much improved weather near Cook Strait, the passage between New Zealand's two main islands. At an estimated 150 miles out from New Zealand the crew had dropped a wreath in memory of the two New Zealanders who had disappeared during their attempt to cross the Tasman earlier that year. While the New Zealand Air Force overhauled the Southern Cross free of charge Kingsford Smith and Charles Ulm were taken on a triumphant tour of New Zealand, flying in Bristol Fighters. The return to Sydney was made from Blenheim, a small city at the north of the South Island. Hampered by fog, severe weather and a minor navigational error, the flight to Richmond took over 23 hours; on touchdown the aircraft had only enough fuel for another 10 minutes flying. On 31 March 1929, enroute from Sydney to England, the Southern Cross with Kingsford Smith at the helm made an emergency landing on a mudflat near the mouth of the Glenelg River, in the Kimberley region of northern Western Australia. The Southern Cross was found and rescued after a fortnight's searching, with George Innes Beard, Albert Barunga and Wally from Kunmunya Mission the first overland party to reach the downed aircraft. Two men - Keith Anderson and Bob Hitchcock, in their Westland Widgeon Kookaburra - crash landed in Central Australia and died of thirst and exposure while on their way to help with the search. Despite Kingsford Smith being exonerated by an official enquiry, many sections of the media and public felt that the forced landing, dubbed the 'Coffee Royal' incident after the brew of coffee and brandy which the crew had drunk while awaiting rescue, had been a publicity stunt and that Kingsford Smith was responsible for the deaths. His reputation within Australia never fully recovered during his lifetime. Picture - Postage stamp, Australia, 1931. In 1930, he competed in an England to Australia air race, and, flying solo, won the event. 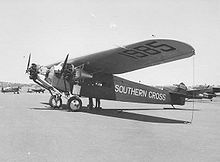 In 1931 he purchased an Avro Avian he named the Southern Cross Minor, to attempt an Australia to England flight. He later sold the aircraft to Captain W.N. "Bill" Lancaster who vanished on 11 April 1933 over the Sahara Desert; Lancaster's remains were not found until 1962. The wreck of the Southern Cross Minor is now in the Queensland Museum. Also in 1931, Smith began developing the Southern Cross automobile as a side project. In 1933 Seven Mile Beach, New South Wales was used by Sir Charles Kingsford Smith as the runway for the first commercial flight between Australia and New Zealand. 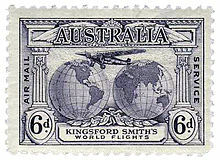 Kingsford Smith and co-pilot Tommy Pethybridge were flying the Lady Southern Cross overnight from Allahabad, India, to Singapore, as part of their attempt to break the England-Australia speed record held by C. W. A. Scott and Tom Campbell Black, when they disappeared over the Andaman Sea in the early hours of 8 November 1935. 18 months later, Burmese fishermen found an undercarriage leg and wheel (with its tyre still inflated) which had been washed ashore at Aye Island in the Gulf of Martaban, 3 km (2 mi) off the southeast coastline of Burma, some 137 km (85 mi) south of Mottama (formerly known as Martaban). Lockheed confirmed the undercarriage leg to be from the Lady Southern Cross. Botanists who examined the weeds clinging to the undercarriage leg estimated that the aircraft itself lies not far from the island at a depth of approximately 15 fathoms (90 ft; 27 m). The undercarriage leg is now on public display at the Powerhouse Museum in Sydney, Australia. In 2009 a Sydney film crew claimed they were certain they had found the Lady Southern Cross. The location of the claimed find was widely mis-reported as "in the Bay of Bengal" - the 2009 search was at the same location where the landing gear had been found in 1937, at Aye Island, in the Andaman Sea. Kingsford Smith was knighted in 1932 for services to aviation and later was appointed honorary Air Commodore of the Royal Australian Air Force. 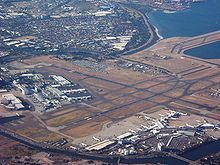 The major airport of Sydney, located in the suburb of Mascot was named Kingsford Smith International Airport in his honour. The federal electorate surrounding the airport is named the Division of Kingsford Smith, and includes the suburb of Kingsford. One of his aircraft, the Southern Cross, is now preserved and displayed in a purpose-built memorial at the International Terminal at Brisbane Airport. Opened in 2009, Kingsford Smith School in the Canberra suburb of Holt was named after the famous aviator, as was Sir Charles Kingsford-Smith Elementary School in Vancouver, Canada. He was pictured on the Australian $20 paper note (in circulation from 1966 until 1994, when the $20 polymer note was introduced to replace it) to honour his contribution to aviation and his accomplishments during his life. He was also depicted on the Australian one-dollar coin of 1997, the centenary of his birth. 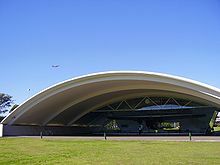 Albert Park in Suva, where he landed on the trans-Pacific flight, now contains the Kingsford Smith Pavilion. A memorial stands at Seven Mile Beach commemorating the first commercial flight to New Zealand. Qantas will name its sixth Airbus A380 (VH-OQF) after Kingsford Smith. The 1946 Australian film Smithy, with Ron Randell as Charles Kingsford Smith and John Tate as Charles Ulm. The 1985 Australian television mini-series A Thousand Skies, with John Walton as Kingsford Smith and Andrew Clarke as Ulm. Bill Bryson details Kingsford Smith's life in his book "Down Under"
Australian author Peter Fitzsimons's book 'Charles Kingsford Smith' details an extensive exploration of Smithy's life and of aviation history. Howard, Frederick (1983). "Kingsford Smith, Sir Charles Edward (1897 - 1935)". Australian Dictionary of Biography. Australian National University. http://www.adb.online.anu.edu.au/biogs/A090602b.htm.htm. Retrieved 2009-03-09. Serle, Percival (1949). "Smith, Charles Edward Kingsford". Dictionary of Australian Biography. Sydney: Angus and Robertson. http://gutenberg.net.au/dictbiog/0-dict-biogSa-Sp.html#smith1. Retrieved 2008-10-16.